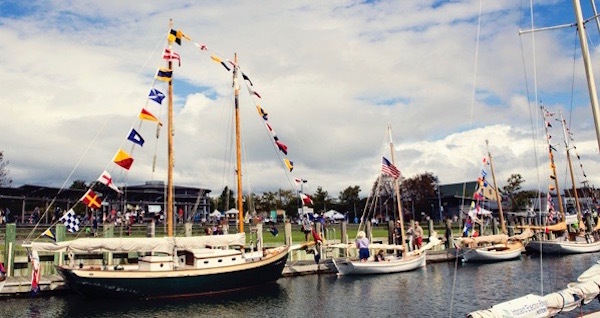 This year will mark the 27th year the East End Seaport Museum has celebrated the nautical history of the East End with a weekend-long Maritime Festival that brings tens of thousands of people to Greenport Village each September. This year’s festival begins on Friday night, Sept. 23, with the Land and Sea Gala cocktail party at the Greenport Yacht and Ship Building Company on Carpenter Street from 5:30 to 9:30 p.m.
More than 23 restaurants, three spirits companies and six wineries will provide refreshments from 6:30 to 9:30 p.m., with a special VIP hour from 5:30 to 6:30 p.m. with a raw bar and live music. Regular tickets are $75 for museum members and $85 for non-members, and the VIP hour is $50 more. Tickets are available online here. Saturday’s events kick off at 10:30 a.m. with The Blessing of the Fleet, a tradition that began centuries ago in Mediterranean fishing communities. During this simple service, Rabbi Gadi Capela and Father Richard Hoerning will offer prayers to the assembled oyster, clamming and fishing fleet, and their captains and crew, for a safe and bountiful season. The parade will kick off at 11 a.m. at Broad Street and the north end of Main Street. It will include sharp-looking midshipmen from the US Merchant Marine Academy, and all 130 strong North Fork NJROTC cadets, the Greenport school band, elected officials, local, civic and cultural organizations. Also marching proudly will be Merfolk, pirates, dance and hula hoop groups, the ELIH pink ladies, volunteers from the fire boat Fire Fighter, San Simeon, and the Fathers of Saint Anargyroi Greek Church. Rolling along will be antique cars, three fire departments, the Shamrock mini train, a unicyclist, Penny Farthing bikes, Little Miss and Mr. Mattituck, the Strawberry Queen, Grand Marshal Captain David Berson, Greenport Brewery’s firetruck, and a surprise from Salt Air Farms. 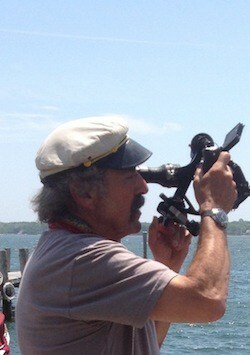 David Berson, the Grand Marshal, holds a 400-ton Merchant Marine Masters License and was a former relief skipper and celestial navigator instructor aboard the schooners Pioneer, Harvey Gamage and Ocean Star, and the yawl Petrel. Captain Berson co-owns and operates Glory with Andrew Rowsom. It is the only Coast Guard certificated, solar charged, electric-powered tour boat in United States, and has been operating from Preston’s dock since 1999, and provides ecological, scenic and educational tours of Greenport’s bays, inlets and shorelines. The parade will be followed by music by The HooDoo Loungers from 1 to 2:30 p.m. in Mitchell Park, displays of classic wooden boats, kayak races, demonstrations of high tech water sports, wood carving and model ship building, delicious food, artisanal vendors, children’s activities, fresh oysters, craft beers and local wines, and a sail to Long Beach Bar “Bug” Lighthouse. Saturday afternoon’s activities for kids include Pirate School and old fashioned games in Mitchell Park. Pirate School is a madcap, swashbuckling one-man family show that allows kids to live the dream, satisfying their universal curiosity for the briny Buccaneers of yore. There will be three shows, from 12:15 to 12:45 p.m., from 2 to 2:30 p.m. and from 3:30 to 4 p.m.
Children (and their parents) are also welcome to try their hand at hoop rolling, bean bag tossing, stilt walking, fish hurling, pitching pirate doubloons, relay races the maritime way, and of course, sack races, from 1:15 to 2 p.m. and from 4 to 5 p.m. on Saturday, and from 11 a.m. to noon and 3 to 4 p.m. on Sunday. Also on Saturday, from 3 to 4 p.m., is the Kayak Race and Demolition Derby. The event was founded and is organized by Otto Schoenstein, who builds wooden kayaks which are disassembled and must be reassembled by teams of two. They are launched by one member, who paddles it out to a buoy, then returns to the beach so the other team member can repeat the course. The first team to successfully complete the course is declared the winner. Part two of the Derby has all the kayaks staged around the buoy. At the sound of a horn, the competitors attempt to sink each other’s kayaks using strategy and their oars. The last boat floating is the winner! Sunday morning starts off with a children’s breakfast shared with mermaids and pirates at Front Street Station from 9 to 11:15 a.m. to benefit Paul Drum Nautical Education Fund. Tickets range from $12 to $18 and are available online here. 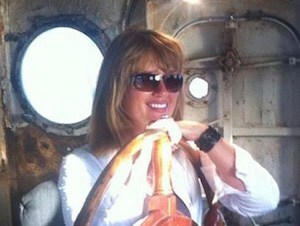 In addition to the street fair, boat shows and family activities throughout the village that continue on Sunday, author Yvonne Lieblein will read from “The Wheelhouse Café” in Mitchell Park at 1 p.m.
Ms. Lieblein, a Greenport native, based her newly published book in and around the North Fork and Manhattan. The book incorporates original songs written by her husband, Josh Horton. Also on Sunday is a snapper fishing contest at the Railroad Dock. Kids ages 8 and under will compete from 1 to 2 p.m., and kids ages 9 to 16 will compete from 2 to 3 p.m.
Singer Tommy Sullivan will perform in the Mitchell Park Amphitheater from 1 to 3 p.m. The Maritime Festival is the largest fundraiser of the East End Seaport Museum, and raises money to enable the museum to continue offering a variety of educational programs to all. More information on this year’s festival is available online here.